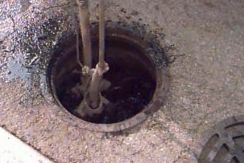 The catch basin (CB) is located by the curb. It’s purpose is to catch rain water from the street and put it into the sewer. Every now and then it needs to be cleaned of debris that builds up from leaves and other items. To date, the City of Chicago has not instituted a regular program that works on a schedule, meaning that the CB only get cleaned when someone request a cleaning; the someone is usually the alderman. Since the 1980’s Wayne has lived in an area that has become neglected. There are many problems in the area and one of the problems is the sewer system. In the 1980’s many of the residents basements would flood. Sometimes only a small amount of water that a sump pump could handle but others where a couple of feet of water would come into a house. One of the things that Wayne did, almost religiously, was to call the city help line (3-1-1) and put in a request to have the catch basin cleaned. If you have a CB in your neighborhood, you should request a cleaning at least once a year. Here is the link to the City of Chicago online request. Note that now instead of using a drop-down list of choices, you need to search through an entire web page just to find what your need to have done.